Tonight, Glee aired a holiday special that was funny, tear-jerking, touching and, simply, "A Very Glee Christmas." 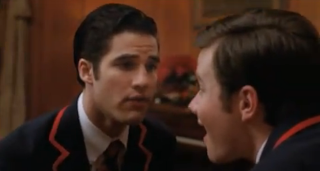 One of the ultimate highlights of the episode was the duet between fellow Warblers Kurt and Blaine, "Baby It's Cold Outside." Can they just kiss already?! Honestly! Though, to be fair, this little will-they-won't-they game between Kurt and Blaine is fantastic to watch unfold. And at least the episode cut of the song didn't include the "Gosh your lips are delicious"—I would've completely lost it at that point.